What is the biggest check (in US dollars) that has ever been written and cashed? I'm not entirely sure as to what the answer to this question is, but I do know that the check written by Mitsubishi UFJ to Morgan Stanley in October of 2008 has to be a contender. On October 13th, 2008, Mitsubishi UFJ wrote Morgan Stanley a check for nine billion dollars (that's $9,000,000,000.00). That's right - a check. They didn't wire the money - they wrote a check. It was the fall of 2008, and the global economy was on the verge of completely imploding. Lehman Brothers had failed. Bear Stearns had been purchased for a song by JP Morgan. Firms such as Goldman Sachs and Morgan Stanley were in very real danger of going under. Morgan Stanley was in very dire straits and needed to find a capital injection/credit line or a company that was willing to purchase them outright. The Chinese were asked to consider an investment in the company. JP Morgan was asked if they would consider purchasing the company. Any number of different scenarios were considered, as the government desperately did not want Morgan Stanley to go under. Mitsubishi UFJ came to the rescue in the form of a $9 billion dollar investment in Morgan Stanley, as well as the extension of a much-needed credit line. So why the check? Why not just wire the money? The two sides had finally come to terms on their deal during the Columbus Day long weekend. Due to the fact that Morgan Stanley's stock had cratered between the time that the two sides had agreed to a term sheet and the time that they actually "shook hands" on the deal, Mitsubishi UFJ was able to negotiate a better deal for themselves. The deal, which many thought wouldn't end up taking place, was finally closed on the Sunday of the 2008 Columbus Day long weekend. However, a different problem now presented itself. Japanese and American banks were both closed on Monday due to holiday long weekends. It just happened to be one of those rare cases when both Japanese and American banks were closed on the same weekday. Morgan Stanley was in such bad shape that they needed the capital injection and access to the credit line, and fast. In addition, they desperately needed to formally announce the deal so that the pressure would be taken off of their rapidly declining stock. The market was hammering shares of Morgan Stanley due to the fact that they had not yet formally announced a merger or capital injection. 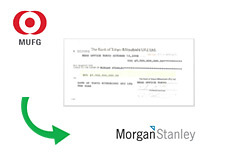 A $9 billion dollar check was cut by The Bank of Tokyo-Mitsubishi UFJ, Ltd. on October 13th, 2008, and Morgan Stanley was saved. Top-level executives from Mitsubishi UFJ reportedly hand-delivered the check to Morgan Stanley on Monday, October 13th, 2008, and also took a few pictures to remember the occasion. It's not often that you hand over a check for nine billion dollars. A copy of the nine billion dollar check can be viewed here.